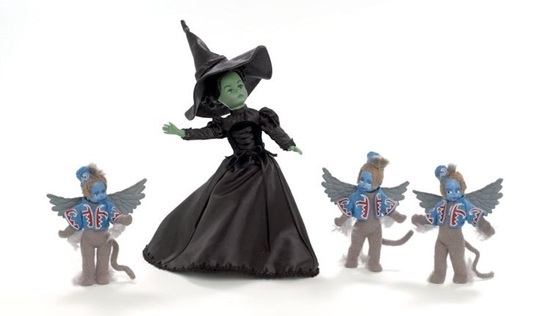 New in 2013 we are pleased to share "The Wicked Witch of The West and The Winged Monkeys" from Madame Alexander's Wizard of Oz Collection. This is a limited edition of 300 pieces celebrating the movie's 75th Anniversary. This is a 10-inch fully-articulated doll with dark eyes and black hair that is pulled up into a top-knot. She is weariing a black, full-length taffeta dress with leg-o-mutton sleeves. Strips of black velvet trim embellish the top of the sleeves and black lace does the same for the edge of the sleeves and the hem of her skirt. A black flock corset that has decorative black, satin ribbon lacing in the front and functional lacing in the back, adds dimension to her witchy dress. The skirt is lined with white taffeta and black tights with a black flock. Black lace-up boots are worn underneath her dress. A large shiny, point black hat with a shirred band, sits atop her green head and completes this courant of bad witch ensemble. Her cohorts, the Winged Monkeys, are 5-inches tall and made of a soft gray plush. They are dressed in gray fleece unitards with blue boleros, red and white printed trim and blue felt hats with matching trim. They have mittened hands , a wired tail, and attached gray wings. Gray fur mohawks glued atop their heads add the final touches to these adorable little dark friends of the Wicked Witch of The West.